Easter will be here soon! If you are looking form some great toys to fill those baskets with make sure to check out Melissa & Doug. They have toys for all ages! 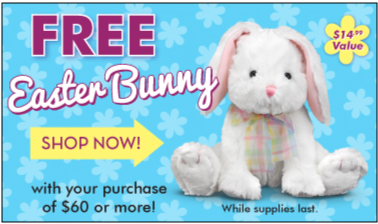 You can fill your baskets with bunny rabbits, lambs, classic toys and other great gifts! Not only do you have the opportunity to win this giveaway but you can also head on over to the Melissa & Doug on Facebook fan page and then click on the Play to 250k Sweepstakes tab to enter the Play to 250,000 Fans Sweepstakes. Each time their fan base grows by 1,000 fans, a fan will win a selection of Melissa & Doug toys. Plus, when the Facebook page reaches 250,000 fans, all fans will receive a special gift. WOW!! One lucky winner will receive a $150.00 Gift Code to Melissa & Doug! Giveaway ends March 29th at 11:59pm, open to US only, ages 18+. To enter please use the Rafflecopter form below. Good luck! Disclaimer: By entering this giveaway you agree to receive email communications from Melissa & Doug. Disclosure: No purchase is necessary to enter. Void where prohibited by law. The odds of winning are based on the number of entries received. This promotion is no way sponsored, endorsed or administered by, or associated with, Facebook and is Facebook-compliant. Winners will be notified by email. Prize fulfillment is the sole responsibility of the sponsor. MumbleBeeInc may not be held liable for Sponsors who do not fulfill prize shipments. I received no compensation for this publication. My opinions are my own and may differ from those of your own. MumbleBeeInc is not responsible for sponsor prize shipment. This event was organized by MomPoweredMedia please contact tina@babycostcutters.com with questions or to see your business or blog featured on the next big event! So many great toys! I like the table top art easles and the giant stuffed animals are really cute too!